Ingredients: Brad Pitt, Jonah Hill, Philip Seymour Hoffman, Robin Wright, Chris Pratt, Reed Diamond and Brent Jennings. Directed by Bennett Miller. Run time: 133 minutes. Rated: PG-13. At First Bite: Well, after watching a mediocre sports film, I had to go with one I knew would be much better. I love movies about baseball: THE NATURAL, SANDLOT, BULL DURHAM, THE BAD NEWS BEARS, FIELD OF DREAMS, EIGHT MEN OUT, MAJOR LEAGUE, FOR LOVE OF THE GAME, SOUL OF THE GAME and A LEAGUE OF THEIR OWN. Growing up, I played baseball for 10 years. I didn't hit for power, but I got on base, hustled on every play and had a better-than-average glove. I was a Moneyball guy. I'm still that kind of player when rec league softball comes around each year. MONEYBALL is the story of how Billy Beane (Pitt) tried to re-invent the game of baseball in 2002 with a salary of just around $40 million, which was almost 3 times less than the New York Yankees. Tough to Swallow: The film begins at the end of the 2001 season. Billy and Pete (Hill) pick Jeremy Giambi and Chad Bradford as two of the guys to sign for the 2002 season. In reality, both players were already on the roster (since 2000). Standings, as of May 23, 2002, are shown on screen. The A's record is 20-26. However, the next home game they lose in the film is to the Baltimore Orioles (when Billy confronts a dancing Giambi). In fact, the May 23rd game was the last time the A's played the O's at home that season. In the film, Carlos Peña is traded before the 20-game winning streak. Yet, during footage of the 14th win he's shown running in from 1st base to celebrate. Game Five of the 2002 ALDS was a day game, not a night game. Although the film shows Tim Hudson a couple of times, there's no mention of the Big 3 as a factor in the team's success. Hudson went 15-9 with a 2.98 ERA. Mark Mulder went 19-7 with a 3.47 ERA, and Barry Zito went 23-5 with a 2.75 ERA. I'm not sure anyone would believe Kerris Dorsey is the daughter of Brad Pitt and Robin Wright. The scenes of the young Billy Beane have him playing against the Los Angeles Dodgers in 1985 as a New York Met. Beane played 8 games as a Met that year, none against the Dodgers. In fact, Beane never faced the Dodgers in his career. The Boston Red Sox 2004 and 2007 championship banners are visible when Billy goes to Fenway Park about a job offer (at the conclusion of the 2002 season). Something to Chew On: The project began in 2009 with Steven Soderbergh at the helm. Pitt and Demetri Martin were the leads, and numerous former players/coaches were set to play themselves. This is Miller's second feature film. He previously directed CAPOTE in 2005. The character of Peter Brand is based on Paul DePodesta. Spike Jonze appears uncredited as Alán, Billy's ex-wife's new husband. Beane had remarried, but scenes shot with the new wife were cut. Former major leaguer Royce Clayton plays Miguel Tejada. Former major leaguer Chad Kreuter plays A's pitching coach Rick Peterson. Stephen Bishop, who plays David Justice, is a former Atlanta Braves minor leaguer. His nickname was Young Justice. Derrin Ebert, who plays Mike Magnante, was a reliever for the Braves in 1999. Glenn Morshower (Aaron Pierce on "24"), mostly known for his roles as military personnel, law enforcement officers and government agents, plays A's scout Ron Hopkins. Pitt is also credited as a producer. The film received 6 Oscar nominations: Film Editing, Sound Mixing, Adapted Screenplay, Best Actor, Best Supporting Actor and Best Picture. Aftertaste: It's a baseball movie, but it's more about the business of the game than the game itself. The movie focuses on Beane and Brand and their new approach to finding players, Moneyball. Makes sense. When you have the second-lowest payroll in Major League Baseball, how do fill the gaps made by losing three of your best players? Sabermetrics. Google it. That's not all the movie is about though. Otherwise, it's a 133-minute long movie about how certain stats are more important when it comes to evaluating players. 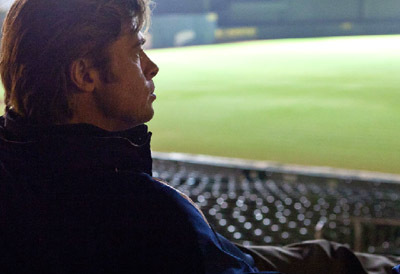 The movie is also about the man, Billy Beane, and his struggles. I think Pitt's performance is what will appeal to non-sports fans. He shows the frustration and pain on his face even when he seems like he might have it all together. And, Hill was great is his first serious role. I wouldn't be surprised if Aaron Sorkin doesn't take home the screenplay Oscar again this year. He had help from Steven Zaillian this time though. It's a compelling drama with some baseball tossed in for good measure. Maybe not a homerun, since, even with the help of MLB, the filmmakers got their facts wrong in some instances.